Defendants are due in Los Angeles courtroom on June 29 for arraignment. Sahar Sarid’s mugshot after being arrested in Florida. He faces arraignment in California later this month. The defendants in a criminal case against Mugshots.com’s owners face arraignment on June 29, according to the Superior Court of California website. Domain investor Sahar Sarid is among the four people named in the complaint. He faced extradition to California to face the charges brought by the Attorney General there. The extradition hearing in Florida was dropped, apparently after Sarid turned himself in in California. 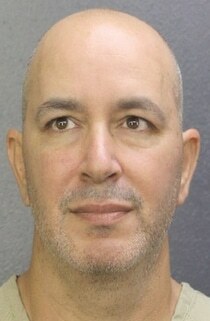 Sarid faces 51 counts including extortion, money laundering, and identity theft. The Attorney General alleges that he and the other defendants extorted people by charging them to have their mugshot and arrest records removed from the website in violation of the law. The Mugshots.com website does not currently resolve. Did he ever make bail? The mugshots.com website has been down for four days now. Last week I filed a complaint with their webhost, Amazon AWS. I doubt Amazon wants to be associated with hosting a criminal enterprise. I also filed a DMCA notice because the photo they posted of me was a photo I took of myself (in my state, we have to provide our own photos to law enforcement). I hope the government siezes the domain so nobody can ever use it again. Assuming they have computer / Internet access. Hopefully they will end up incarcerated and then have years of probation with no Internet or computer access. In any case, it doesn’t matter where the website is hosted – if they continued this behavior, the acts could still be prosecuted in the US. I don’t have much faith in the go’;t to do the right thing about this issue ever. They will no longer charge for mugshot removal. This exempts them from the Fla law, not sure about California. They will not remove any mugshot apparently unless the record has been sealed or expunged and you must provide a written order signed by judge. Just another way to make you run through hoops. If you have been found not guilty, had your charges discharged or dropped they will not remove the mugshot and accompanying record of your arrest. If this is the case you must again have a signed order by a judge to submit to them stating the charges were discharged or that you were found not guilty. They will not remove the mugshot but supposedly list it prominently that your charges were dropped or you will found not guilty. So once again these little jerks have found a way to skit poorly written laws. I would assume since they aren’t charging for mugshot removal they may be going to an advertising revenue. If this is the case a Federal Judge in Chicago has taken the stance in 2017 that your mugshot used in that capacity may violate your rights of publicity. So if the are using your information to generate ad revenue that may be actionable. Clearly it’s going to take a class action lawsuit to bankrupt these guys and take them out. Our representatives simply don’t have the smarts or the cajones to do it. And lastly local PD;s have to stop allowing these people to scrape their servers for this information. At this point I don’t see the State of California prevailing on the criminal charges unless they have been engaged in ripping of credit card numbers from people who purchased depublishing rights. I noticed when I looked the day the California AG announced its charges that the “takedown” site they were linking to said it wasn’t charging to take down the mugshot…they were only charging to remove the listing from Google. Not sure how that will fly in court. In Florida our illustrious AG Pam Bondi who hasn’t met a tv camera she doesn’t like was harassed by a crowd at a movie theater in Tampa over the weekend. Lo and behold she shows up in NY on Fox News this morning complaining about how she was treated.
. Ask her to explain how she will enforce the new Florida mugshot law which kicks in on July 1, she can’t explain the law or how she will enforce it and says she doens;t free legal advise. She has no empathy for innocent people who have been harmed by false and malicious charges, by the local PDs who let mugshots scrape their records and finally by the websites themselves. But she has plenty of time to air her grievances at tax payers expense. It’s up and running on Thursday Don;t know ifs updating now. You would think that their attorneys would tell them to layoff until after their trial. Just shows you the arrogance and the greed of the four. I really and truly hope that these clowns get everything they deserve and beyond for destroying the lives of innocent people who were arrested and had charges dropped or were found not guilty. They refused to remove those entries from their website. I hope he is living thru hell now considering the crap he put many innocent people thru on his reputation smearing, extortion site. Thomas Keesee is an arrogant punk. He likes to laugh and berate people over the phone who asked that they be removed form the site because there charges were dropped. They were so greedy if you had more than one charge on the arrest they required $399 for each charge. This is outright extortion but it’s iffy if the state of California will prevail. I don’t trust the courts and the law at all. I’ve seen innocent people ruined and criminals become the victim and get away with far too much. And to think that Jeff Bezos, richest man in the world provided Amazon servers to host this criminal enterprise. How much money in the world does he need. I also hold the search engines, especially google and Bing responsible. At this timer using webmaster tool Google makes available you can request a page be removed and it is. However Bing and Microsoft utilize such a crappy search engine their SE can not determine that the sight is offline and gone even after 4 days. Bing takes forever to update one page cached since 2012 and they will not try to recrawl or update their results. Why, because it generates revenue for them. This is at least the third time arraignment has been scheduled, so we’ll see what happens. Sounds like this got personal. Hopefully you were not a victim of these scumbags. At least that site is down now which is a step in tbe right direction. Cannot undo any harm done, but can stop any new harm to previous victims and other innocent people. I really am wishing these wastes of flesh the absolute worst possible outcome. Making money this way is just horrible. Forget the illegal part, of course it is illegal. Just cant imagine how these POS’s slept at night. Very personal I was falsely accused of a crime. I had the most excellent of alibis I lived 1000 miles away and had for 4 years before the complaint and 12 years after. The authorities knew this. 19 days later I went to court. I was in court three minutes. The State Attorney stated they had no reason to ever charge me, no reason to arrest me, no reason to prosecute me and no reason to detain me. Of course they could have settled all of this with my attorney and simply withdrew the charges before I turned myself in but they did not. The charges were discharged – Nolle prosequi Because I had an assault charge 18 years earlier which came out of defending my elderly father from a 23 yo punk who was assaulting him and robbing him and whom I got the best of , the court would not seal or expunge the record. Two years later mughsots.com posted my arrest and charges. It included the statement that the charges were dropped. I called them, they found my request to be grounds for their personal amusement, pronounced me guilty and said they would never remove my name. They then updated the page to include my name 15 times so that it would go to the top of web rankings. I lost a job and a career because of their posting and I will soon probably be out on the street because of these people. It destroyed a very good and close personal relationship with a great woman. All because of a lie by a vindictive person, whom I later sued to the ying yang and destroyed financially. And then I was victimized by the state whom released the record of my arrest to these people, and finally by mnmugshots.com. I hate each and every one of them. I hate the police and I hate the courts for allowing all of this to happen. They should have known that the complainant was a liar. They sure knew for a fact that I was living 1000 miles away and working and had positive proof where I was but it didn’t seem to matter. Wow. That is an awful story. Very sorry to hear that OS. I imagined stories of this nature as soon as i heard these scumbags were operating this horrible site. Hope life is better now somehow for you. At least we can hope that justice will be served on June 29th for these morally corrupt low lifes. Heres to better days without mugshots.com online now. In the meantime, Bing owned by Microsoft doesn’t give a damn. Their content removal tools don’t seem to recognize that mugshots.com is down and throws out an error message they cannot confirm it is down. Emails to their legal department asking them to remove the search results for mugshots.com since the site is down go unanswered and no action taken, so thousands of people are being trashed with the aid of Bing and Bill Gates. People need to raise heck with Amazon and make their participation known and chide Bing and other search engines for not maintaining their search engines and allowing these sites to prosper. Looking forward to those that are guilty turning in their accomplices. So many others not currently named should be charged as well. Drain the domain swamp. If you had anything to do with this, wait for the knock on the door. Your life is about to change forever. I have no faith in the courts and doubt if anything is done about this. They have no fear as their website is up and running and they are still extorting money. One would thing legal counsel would tell them to shut it down. These clowns are arrogant SOBs who don’t care and think that they are above the law. 6/29/2018 The arrogance of these guys. The are almost like serial harassers and stalkers. Their latest ploy to enhance search engine rankings is to include links on each page to another persons mugshot listed alphabetically before and after ones name, so that your name is searched those entries pop up as well with the results of other people who have your name on their page as a link. So they have increased their ranking 3 times What a bunch of rotten pathetic human beings. I understand an attorney in Long Island NY may be involved in ownership of the site. If so where is the NY bar and why aren’t they taking some type of action condemning this practice demanding that he protect innocent people and those with favorable outcomes. Can’t understand why Adam Dicker wasn’t charged? New law took hold in Florida Sunday July 1. As expected Mugshots.com refuses to follow the law requiring them to remove mugshots of those with favorable outcome on requests. Their policy is only to label the mugshot with some type of banner which proclaims the outcome. This will only be done if one obtains documentation from the court signed by a judge and with a court seal and submitted to them . Hard for the average person to obtain by themselves and probably requires the expense of an attorney to do. About all an individual can obtain is court documentation signed by a clerk of court, So they continue tp play games. With all of the legal troubles they face you would think they would wise up. None of the owners on mugshots.com appear on their own website so it seems that their policy is fraudulent since they have not gone to trial as of yet. It also seems that they are seeking advertisers. This may place them in further legal jeopardy in using peoples names. These people are arrogant. The Florida States attorney has been informed of their refusal to comply. The media needs to get further involved and force or legislatures to act. I would suggest that anyone seeking removal of record do not even fool with obtaining the court documentation and expense of doing so. The will only mark the disposition on the mugshot and more than likely they will simply reject your request without explanation as to why and refer you to the link regarding removal procedures on their site. In some cases the record they scraped from the local PD lists the charges were dropped or resolve. They won’t even honor that. Complete crooks. I can’t understand why Kelly Ellis (Carthage, MO) who is the sole owner of cleansearch.net and removearrest.com wasn’t charged. The CA Attorney General even mention’s cleansearch in his initial announcement about these bottom feeding scum bags. Kelly Ellis is a real pyscho piece of trash and totally needs to be locked up. I hate to say this but someone is going to have their fill of this bunch and be weary of being ruined because of this nonsense and it things may not end well .